plus a special report by Dr. Michael Roizen, MD! Thanks to huge advances in healthcare and wellness, living to a healthy 90 or 100 years is quite possible today. In fact, when you're armed with the right strategies for diet, exercise, sleep, stress management, and supplements, that happy ripe old age isn't just possible, but probable. But enjoying your richest life is not just about feeling vibrant and vital longer... it's ALSO about being financially comfortable. Here at A Rich Life, we think it makes perfect sense to marry your financial and physical health. And what better place to invest than the very sector helping to make YOU more healthy… especially when it's slated to explode in the coming years. Sign up for this free letter and get Dr. Mike's report for smart patients: 25 Questions You Must Ask at the Hospital! 100% privacy. No Spam. Opt-out at any time. That's why healthcare is what A Rich Life is all about, both physically and financially. We've tapped Senior Healthcare Analyst Chris Wood—a 15-year veteran of health and biotech investing—to be the main editor of our free weekly newsletter, A Rich Life. Chris shows you how owning the right healthcare stocks can earn you outsized gains. But Chris isn't working alone to provide you with everything for A Rich Life. Chief Medical Officer Dr. Mike Roizen, MD, and Chief Science Officer Patrick Cox each feature once per month with actionable advice on staying healthier, longer. Dr. Roizen—usually referred to as "Dr. Mike"—might already be well known to you. He's the chief wellness officer at the prestigious Cleveland Clinic. He's also chief medical consultant for the wildly popular Dr. Oz Show. You'll get the very best health and wellness advice from Dr. Mike every time. And Patrick's the editor of our advisory Transformational Technology Alert. He'll help you understand the news, data, and analysis you need to keep your portfolio (and yourself) healthy too. 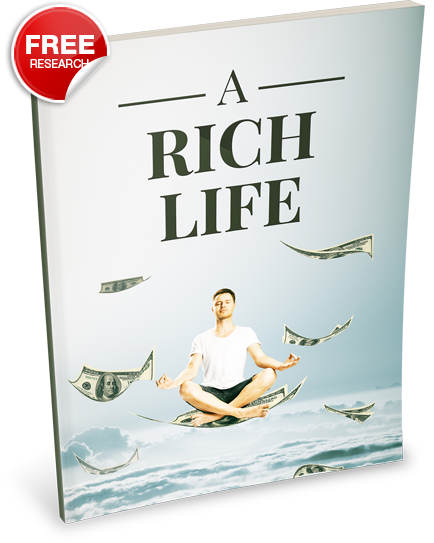 Each free weekly issue will cover something worth knowing for a healthier, wealthier life for decades to come. Just type your email address below to have A Rich Life delivered straight to your inbox every Monday... and if you sign up today, we'll rush you your copy of Dr. Mike's report for smart patients, 25 Questions You Must Ask at the Hospital. Copyright © 2018 Health & Wealth Research, a division of Mauldin Economics, LLC. All Rights Reserved.